Washington | Christine Blasey Ford remembers one thing above all else about the day 36 years ago she says Donald Trump’s Supreme Court nominee sexually assaulted her in a bedroom while a friend watched. “Indelible in the hippocampus is the laughter, the uproarious laughter between the two. They’re having fun at my expense,” Dr Ford said. “They were laughing with each other”. Dr Ford’s emotional testimony before the Senate Judiciary Committee appeared to leave Brett Kavanaugh’s nomination hanging by a thread, as well as pave the way for decades of division and repercussion, and set an example for victims of sexual assault the world over that going public in the search for justice can be worth the personal cost. It also unleashed a blisteringly angry defence from Judge Kavanaugh who defended his innocence and blasted Democrats for orchestrating a “grotesque and coordinated character assassination”. “My family and my name have been totally and permanently destroyed by vicious and false accusation,” he said. Judge Kavanaugh warned of the dark forces that have been unleashed by the process. This is all to “blow me up and take me down”. Judge Kavanaugh defended his innocence and blasted Democrats for orchestrating a “grotesque and coordinated character assassination”. President Trump tweeted that he continued to support his nominee and pressed the Senate to hold a vote. 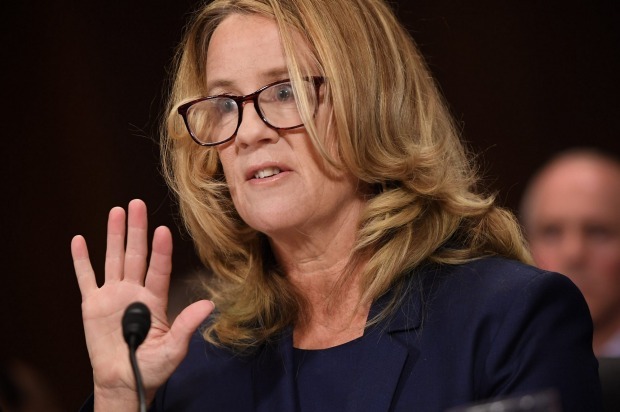 Fox News’ Chris Wallace described Dr Ford’s testimony as: “extremely emotional, extremely raw, and extremely credible”. She described how as a 15 year old at a party she was pushed from behind into a bedroom assaulted by Judge Kavanaugh while his friend Mark Judge stood nearby. They turned up the music in the bedroom before “I was pushed onto the bed and Brett got on top of me. He began running his hands over my body and grinding his hips into me”. When he put his hand over her mouth to stop her from screaming, “I thought Brett was accidentally going to kill me”. Dr Ford said the assault “drastically altered my life”. “For a very long time, I was too afraid and ashamed to tell anyone the details. Over more than three hours of hearings during which the 11 male Republican majority members outsourced their questions to a female prosecutor, the longer Dr Ford spoke the further her public credibility seemed to rise. Many strategists said President Trump should have instead followed the precedent set by George HW Bush when Anita Hill accused Justice Clarence Thomas of sexual misconduct in 1991 and ordered an FBI investigation. 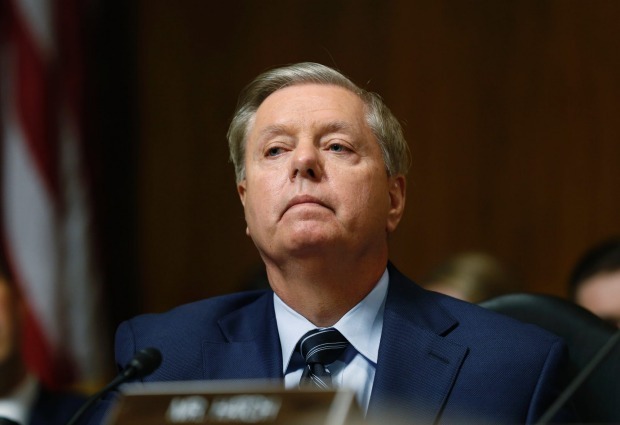 Republican Senator Lindsey Graham lashed out at the Democrats for politicising the nomination and “ambushing” the committee. 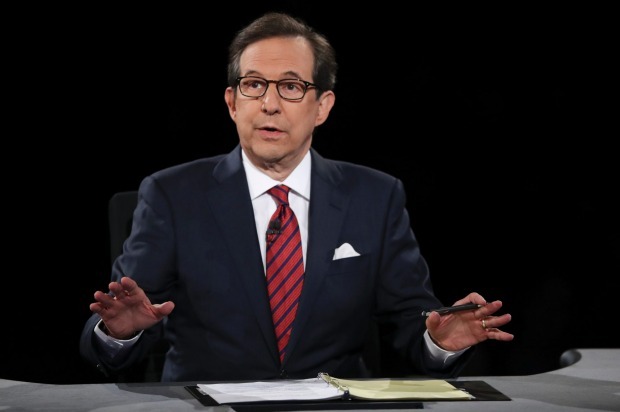 “This is a disaster for the Republicans,” said Chris Wallace, a prominent commentator on Fox News, President Trump’s favourite network, of the choice of an independent cross-examiner. Of Dr Ford’s evidence, Mr Wallace described it as: “extremely emotional, extremely raw, and extremely credible”. “Nobody could listen to her deliver those words and talk about the assault and the impact it had on her life and not have your heart go out to her,” he said. Before Mr Kavanaugh had an opportunity to present his side of the story, Republicans were gloomy about his prospects of surviving Thursday’s tumultuous hearing. “We’ve not spoken to a single Republican so far who thinks this is going well for them. Most think it’s an abject disaster,” reported Politico. Speaking after Dr Ford finished her evidence, Republican Senator Lindsey Graham lashed out at the Democrats for politicising the nomination and “ambushing” the committee by withholding Dr Ford’s story until the last minute, rather than allowing a full inquiry to happen. “She’s just as much a victim of this as Brett Kavanaugh is because somebody betrayed her trust” by leaking a confidential letter she wrote to the Democrats in July. Under cross examination from Rachel Mitchell, a lawyer hired by Republican committee Senators, Dr Ford said she was “100 per cent” certain her assailant was Judge Kavanaugh. Focussing in on the nitty gritty of Dr Ford’s story, Ms Mitchell asked questions about a polygraph test she took, probed her claims to be fearful of flying – asked whether she had ever flown to Australia (“No”) – and who funded her legal support. The softly-softly approach by Ms Mitchell angered some Republicans who say GOP Senators should have been given an opportunity to subject Dr Ford to more aggressive examination. Prominent Fox News judicial analyst Andrew Napolitano said Ms Mitchell has not been able to lay a glove on Dr Ford. Thursday’s hearings have dashed any prospect that Mr Trump can dash through a confirmation without risking a major backlash from moderate Republicans and women. However, jettisoning Judge Kavanaugh’s nomination is just as politically risky for the president. A replacement candidate wouldn’t be subject to a vote until the new year, which is after the November midterms, which may see Democrats win control of the Senate – dashing the Republican dream of swinging the Supreme Court’s balance decisively to the right, potentially for decades, particularly on abortion rights. 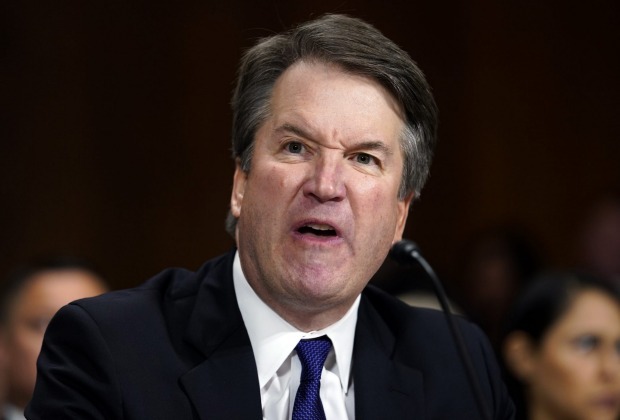 In his torrid defence, as he repeatedly fought back tears, Judge Kavanaugh vowed the assault charges are “not who I am”.